Although Asiana has three travel classes, most services are two class only, with First only used on the flagship route to New York, Chicago, and also for the much shorter hop to Tokyo. In truth, the main perk of First Class is the use of the excellent First Class lounge in Seoul, and there isn't so much of a leap in quality between First and Business class as there is on other airlines. Business Class now comes with a lie flat seat on most long-haul aircraft. And economy is now very confusingly called "Travel Class", a name that seems like a question, and which often provokes the answer at check in "yes, cattle". There are seatback TVs in all classes on all widebody jets except on one of the Boeing 747s. 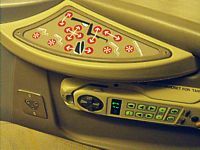 ... read more about Asiana Seatback TV. Asiana Airlines is planning to return all of its leased Boeing 747-400 passenger aircraft (oddly, some appear destined for it's stable make Korean Air for a while) and it has a plan to convert three B747-400M to freighters. In order to compensate for the loss of these passenger jets, Asiana will introduce two Boeing 777-200ER aircraft, which will be built as three class planes. Asiana have recently changed their livery, from a rather drab grey to white, with an accented A and a more colourful tail. 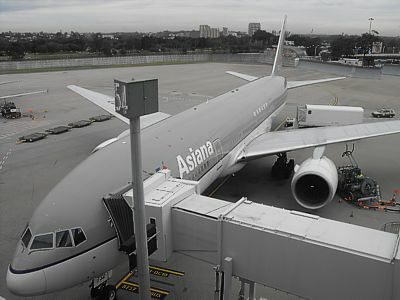 Asiana has eleven of the smaller version of the 777, the 200 model, of which five have AVOD. Three additional planes are on order from Boeing, which will have an additional first class cabin. The cabins look rather drab, with a beige and brown colour scheme. Asiana's new Business class seat is sold as lie-flat, however it is a little behind the curve, and is best described as a second generation business class seat, because it doesn't go level, only reclining to 167 degrees, with a pitch of 58 inches. It really isn't very comfortable, and in lie-slope mode there is only a small metal bar to stop you from slipping off. This footrest will result in you getting a grove across the bottom of your feet after a few hours. Anyone over six feet tall with also find the seat too short, and you will end up having to sleep upright anyway. The new seats are in a 2-3-2 layout, and a privacy divider between the seats. Each seat has power with a standard Boeing plug. There is however a 15 inch monitor, which is either screwed to the seat in front, or for row 1, on the bulkhead (which makes watching TV while in lie-slope mode rather difficult). There are two lights: one overhead (the switch is on the handset) and one on the little extendable metal stalk. This has two switches in the head, to switch it on, and to select the brightness level. 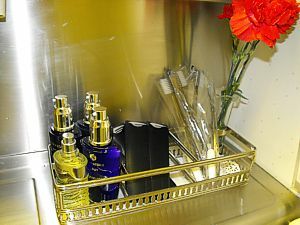 In the armrest is the tray table, and the dividing arm also has two pullout wings (for the hot towels) and a central pullout section (for canapes) plus a pullout draw (for water bottles). There are also three slots in the seat infront of you, with a lip of a table (for water) a slot (for washbags) and below that a bin (for slippers and eyeshades). On the 777-200, there are three different models flying. 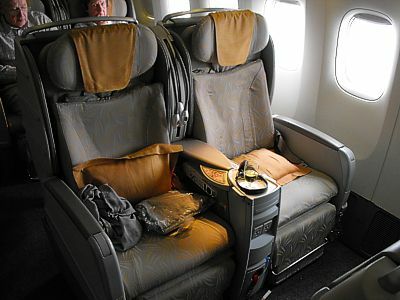 Old aircraft, with the old seat, have five complete rows of seats in business class. 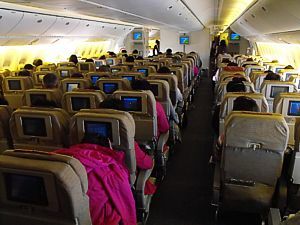 If there are four rows (with 2 each seats in each side at row 5) you get new seats and AVOD, however the most common type is to have no row 5 at all (and no loos by the cockpit) where you get new seats but AVOD is missing. A simpler way of checking is to see if there is a small bar area in the foremost galley: if there is, there is AVOD. The bathrooms are nicely equipped there are toothbrush packs with combs, mouthwash, 3 bottles of spray and moisturizer, plus a little bunch of flowers. There are also bathrooms at the back of the cabin so row 4 or 5 is least desirable. In economy seats are the pretty basic Boeing model, but with the joy of a 34" pitch. This is a couple of inches more than most airlines (like Singapore), and six inches more than some. You really do notice the difference: it's much less cramped. The seats are also in a 3-3-3 layout, giving more width than some airlines (like Emirates) which cram in 4 rows across in the middle. a 3 inch monitor. In both types of aircraft there is a magazine rack on the back wall of each bulkhead. These are normally stocked with a lot of Korean mags, Time and Business Traveller. There is currently just one three class 777, that flies daily just to Chicago, however it will be joined by two others shortly which will be used on the flagship New York and LA routes. Asiana used to have a large fleet of Boeing 747s, but now only has 4 left, 2 of which are all passenger versions, and 2 which are the unique 747 combi. They are used for the flagship route to New York, and also for the much shorter hop to Tokyo: the only routes on which Asiana still has a First Class cabin. 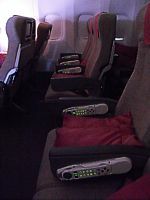 Two combi's also have new First Class and AVOD on all classes. One combi does not, and it was supposed to be converted to an all cargo version. However cargo demand has been dropped sharply, so Asiana keeps postponing converting work for the dark 747 combi. This one mainly running on intra-Asia routes, though. If your seat wasn't lie-angled flat, then yours is the dark one. Refurbished ones have huge monitor at the back of front seats, which is AVOD. The only dark 747-400 combi without the new C seats and AVOD and the old F seats is HL7417 in the old Asiana livery. That plane mostly runs flights between Hong Kong and Seoul. Asiana has seven 767-300s, which are used on Domestic and short-haul routes. The planes seat 15 in business class, and 235 in economy. Asiana's 767 Business class seat is pretty good: seats are in a 2-1-2 layout, giving slightly more width (20")than you'd expect, and a 50" pitch, and 168 degrees of recline. However on full recline, the seats to feel a bit hemmed in. However in business, there is a full AVOD inflight entertainment system with 15" seatback TV. Economy is however pretty basic, in a 2-3-2 layout, starting in row 10. Row 26 is an emergency exit, with lots of space ahead of you. There are no seatback TVs, just overhead monitors, in economy. Asiana now has a small fleet of the small single isle Airbus aircraft. There are 11 of the Airbus A320-200, seating 8 in business class and 138 in economy, plus there are also 15 of the larger A321, seating 12 in business and 165 in economy. The A320s seat 135, in economy with a 3-3 layout. Row 17 and Row 18 are the overwing emergency exit - if you ask to sit here, you will get 2 inches more legroom. Row 18 is highly prized, as the seat here reclines fully. Pitch is 33" and width is 17"